John Ronald Reuel Tolkien was born on this day in Bournemouth, Orange Free State, South Africa) in 1892. Today is the 120th anniversary of his birth. 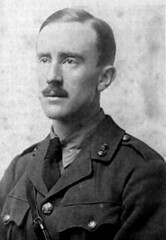 Tolkien is the older of two boys born to Arthur Reuel Tolkien and Mabel Suffield Tolkien. The family lived in South Africa where Arthur was head of the Bloemfontein office of a British bank. While he was in England on an extended holiday with his mother and brother Hilary his father passed away from rheumatic fever. Mabel Tolkien then moved in with her parents and a succession of relatives in the West Midlands. Mabel and her sister May caused quite a stir when they (and the boys) converted to Catholicism in 1900. Sadly, Mabel died in 1904, leaving her son’s well-being in the hands of a series of relatives and acquaintances until they were eventually taken in by a catholic educator, Father Francis. It was he who encouraged and refined Tolkien’s already blooming gift with words. He floated through several postwar academic positions finally settling in the Rawlinson and Bosworth Professorship of Anglo-Saxon back at Oxford [Ibid]. He moved through several other posts, but always remained at Oxford until his retirement in 1959. It was there that he founded a group for those of similar interests called “The Inklings”. In 1936, Susan Dagnall, of the publishing firm of George Allen and Unwin, received and incomplete draft of Tolkien’s “The Hobbit” and implored the author to finish it. “The Hobbit” was published in 1937 and has remained a staple of school reading lists since then. Stanley Unwin was so pleased by the work that he asked if Tolkien had any similar works [Ibid]. Tolkien initially submitted his current draft of “the Silmarillion” ( posthumously published in 1977), but it was rejected by Unwin, who requested something like “the New Hobbit”(2). Understandably disappointed, Tolkien then began work on what would become “The Lord of the Rings“. He continued to write through the outbreak of World War II, the duration of which he served as an Air-Raid Warden, a job, it is said, he participated in with great zeal and enjoyment [“J.R.R. Tolkien: Master of Fantasy” by David R. Collins – Lerner Publications Company – 1992]. “The Lord of the Rings” was published as six books in three parts from 1954 through 1955. The work’s success was as unexpected as Bilbo’s journey in the Hobbit, Tolkien soon received an occult following, as well as a deal to make a highly condensed BBC radio adaption [Tolkien Society]. Tolkien died on September 2, 1973, two years after Edith. Both are buried beneath the same headstone in the Catholic section of Wolvercote cemetery, just north of Oxford. Author’s Note: The majority of today’s blog was written by Maggie (Rita’s kid), so if there are mistakes, they are her fault. However, if you really, really like it, Maggie is partial to tea and dark chocolate, so you ought to convince Rita to gives her exorbitant amounts of both. Rita’s Note: Done! Thanks Maggie! 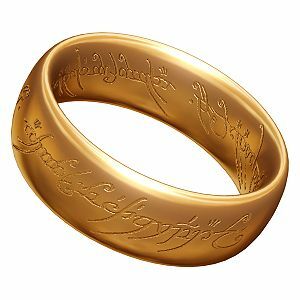 This entry was posted on Friday, January 4th, 2013 at 2:37 am	and tagged with Hobbit, J. R. R. Tolkien, Lord of the Rings and posted in Europe, Fiction, JRR Tolkien, Thought of the Day, Today's Birthday, World War One, Writing. You can follow any responses to this entry through the RSS 2.0 feed. What a delightful blog to read this evening. Maggie should certainly get lots of tea and dark chocolate for work very well done!